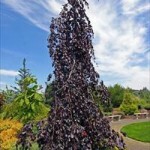 It has the unique combination of being an upright columnar tree with cascading branches. The leaves are dark purple with wavy margins. The leaves become greener throughout the summer. Fall color is yellow to orange-brown. The bark is smooth and silver-gray. 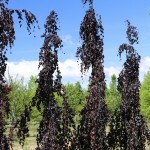 This selection suits a smaller space better than Fagus sylvatica ‘Purpurea Pendula’. It prefers a well-drained soil and full sun.